Steam turbine is a common feature of all thermal power plants. Steam Turbine was invented in 1884 by Sir Charles Parsons, whose first model was connected to a dynamo that generated 7.5 kW (10 hp) of electricity. Exceptional feature of the nuclear power plant is the nuclear reactor and its safety and auxiliary systems. 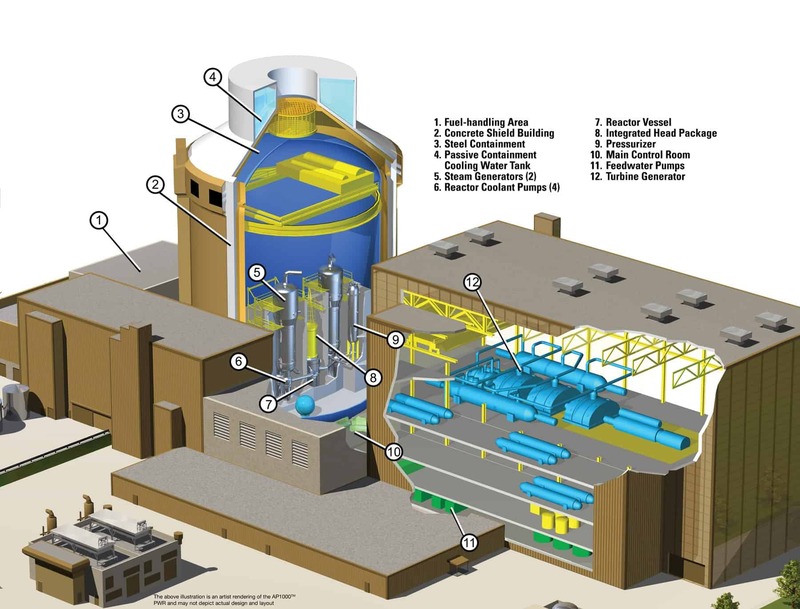 Main features of nuclear power plants with PWR-type (Pressurized Water Reactor) reactor. The containment building is the key building of the nuclear island. It is an air-tight building, which houses a nuclear reactor and its pressurizer, reactor coolant pumps, steam generators, and other equipment or piping that might otherwise release fission products to the atmosphere in the event of an accident. Such buildings are usually made of steel-reinforced concrete. The turbine building is the key building of the conventional (turbine) island. The turbine building houses a turbine, generator, condenser and other equipment, which is used for conversion thermal energy from pressurized steam to mechanical work used for drive the generator. Also a cooling tower can be part of the nuclear power plant, but it is not necessary. Many nuclear power plants (coastal nuclear power plants) do not cool the cooling water via cooling towers. Nuclear Reactor. A nuclear reactor is a key device of nuclear power plants. Main purpose of the nuclear reactor is to initiate and control a sustained nuclear chain reaction. Steam Generators. Steam generators are heat exchangers used to convert feedwater into steam from heat produced in a nuclear reactor core. They are used in pressurized water reactors (PWR) between the primary and secondary coolant loops. Pressurizer. Pressure in the primary circuit is maintained by a pressurizer, a separate vessel that is connected to the primary circuit (hot leg) and partially filled with water which is heated to the saturation temperature (boiling point) for the desired pressure by submerged electrical heaters. Temperature in the pressurizer can be maintained at 345 °C (653 °F), which gives a subcooling margin (the difference between the pressurizer temperature and the highest temperature in the reactor core) of 30 °C. Reactor Coolant Pumps. Reactor coolant pumps are used to pump primary coolant around the primary circuit. These pumps are powerful, they can consume up to 6 MW each and they can be used for heating the primary coolant before a reactor start-up. The heat is produced by fission in a nuclear reactor and passes into the primary cooling water. This heat, deposited in the cooling water, is conducted to the steam generators situated in the containment building. Steam generators produce high pressurized steam. The pressurized steam is then usually fed to a multi-stage steam turbine. Steam turbines in western nuclear power plants are among the largest steam turbines ever. 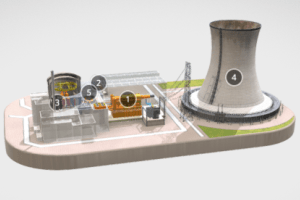 AP1000 – nuclear power plant. This illustration may not depict actual design and layout. The Power Reactor Information System (PRIS), developed and maintained by the IAEA for over four decades, is a comprehensive database focusing on nuclear power plants worldwide. PRIS contains information on power reactors in operation, under construction or those being decommissioned.